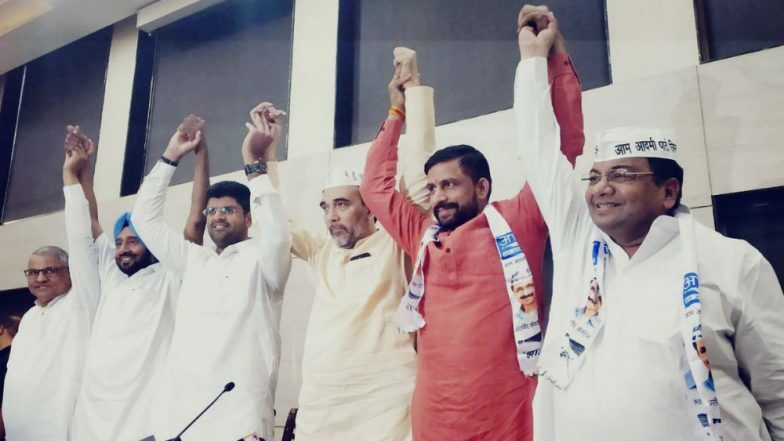 Chandigarh, April 13: The Aam Aadmi Party (AAP) has formed an alliance with Jannayak Janata Party (JJP), headed by former INLD leader and O P Chautala’s grandson Dushyant Chautala, in Haryana for the Lok Sabha elections. As per the seat-sharing agreement between the two parties, the JJP will fight on seven out of 10 seats in Haryana and AAP on three. The development comes after talks between the AAP and the Congress failed. “The combination of Jhadoo (broom - party symbol of AAP) and Chappal (slipper - party symbol of JJP) will drive out all thorns from Haryana,” Dushyant, the JJP founder and Hisar MP, said on Friday. AAP had supported the JJP candidate during the Jind assembly bypolls in January this year. The coalition poses a major threat to the Congress which is trying to make a comeback in the state. Congress to Go Alone in Delhi as Talks with AAP Fail. In the Jind assembly bypolls, while the Bharatiya Janata Party (BJP) candidate won by a margin of 11,000 votes, it was the JJP candidate who came in second, leaving senior Congress leader Randeep Surjewala in third place. The AAP wanted to form an alliance with the Congress on 33 seats of Delhi, Punjab, Haryana, Goa and Chandigarh. However, the grand old party maintained that the tie-up should be restricted only to the national capital. We Want 33 Seats, Not Just 3 if Congress Wants Alliance in Delhi, Says AAP Leader Gopal Rai. Congress's in-charge for Delhi P C Chacko on Friday said the party will go it alone in Delhi since the AAP has taken an “impractical stand” by demanding seats in Punjab, Haryana, Goa and Chandigarh. He, however, said, "We are still ready (for alliance) if AAP is willing to have an alliance in Delhi alone. We want to fight the BJP together." The AAP had on Wednesday rejected the offer of the grand old party for a tie-up in Delhi. All the routes of alliance with the Congress have been closed, AAP’s Rajya Sabha MP Sanjay Singh had said.